It is never easy to blow your own horn but we feel that we have one of the most experienced, knowledgeable and personable group of guides in the country. They will not just help you catch fish but they will make you a better angler and they will share with you their love for Montana and its wonderful natural treasures. Bill Kemph is a native Montanan who grew up fishing and hunting the rivers and forests of SW Montana. For over 20 years, Bill has guided both fishermen and hunters in Montana. He operates his own hunting outfitting business, and is a superb angler, skilled in all aspects of fly fishing including instruction, an accomplished tier and a wonderful stream-side companion. Bart Doig is another native Montana who chose to stay in state and make a career as a professional guide. Like all our guides Bart is a wonderful angler and a terrific stream guide however Bart’s real passion is chasing exceptionally large trout on some of the Stillwater fisheries of SW Montana. 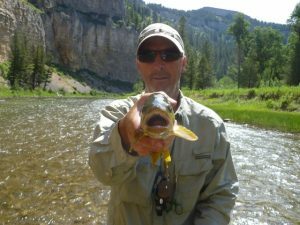 Bart has had clients catch a number of fish in the ten pound class guiding anglers and hunters in Montana for over 25 years. Butch Wicks is an import to Montana. We will forgive him that since he grew up in Oregon and has guided steelhead and trout fishermen for many years in the Northwest and Montana. Butch recently retired from a career as a teacher and now is one of the primary instructors of the “Fish Like a Guide, But, Live Like a Client” Fly Fishing Schools at Healing Waters Lodge. Butch enjoys technical match the hatch type of fishing and is really at home on our spring creeks. Terry Throckmorton grew up in Montana. He has been a fishing and hunting outfitter in southwest Montana for well over 20 years. Terry is another apparently easy going and laid back Montana guide. He is a very easy man with whom to spend time on the water but don’t let that relaxed demeanor fool you! When it comes to finding fish and game Terry is a predator! T.J. Mignault has established an excellent reputation and is one of those guys who is fishing every day of the year when he is not guiding. He knows the Big Hole and Jefferson area very well and we are very happy to have T.J. on our team! Cassandra Osborn is an excellent angler and most pleasant companion on the water. Cassandra has guided anglers in Montana for many years. 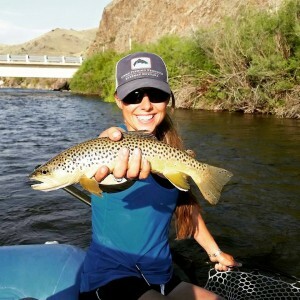 She is a licensed fly fishing outfitter with a reputation as a superb guide. Cassandra spends her summers guiding anglers in Montana and then finds a way to spend the winters pursuing bonefish, permit and tarpon on the flats of some exotic location. Chuck Robbins is not only a veteran fly fishing guide but also a professional photographer and author. 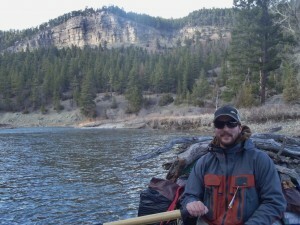 He has written the “Fly Fisher’s Guide to Montana” and “On the Fly Guide to the Northern Rockies”. His photographs have appeared in numerous prestigious magazines such as Montana Outdoors. Originally from Pennsylvania, He is a patient teacher and enjoys sharing his knowledge of spring creek and small meadow stream tactics. Kara Cain grew up hunting and fishing in the mountains of Idaho. 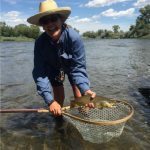 After moving to Dillon, Montana, and fishing some of the best trout rivers and streams around, she decided to become a fly fishing guide. Kara loves having fun on the river and helping clients catch fish. She spends her off season working on the ranch, hunting and fishing…a lot of fishing! 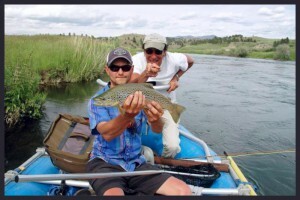 Brian Wheeler has been guiding on whitewater and fly fishing for 13 years in Tennessee, Colorado and Montana. He enjoys getting into the rhythm of multi-day float trips. He thinks there is definitely a romance to Montana and his favorite part of guiding is sharing in the excitement people have getting to float a river here. John Howard could be the most consummate angler I know. He fishes all over the West but part of John’s strength as a guide is the pure joy of having him in a boat all day. He has all the skill of both a great guide and angler and none of the conceit that can filter into guiding. John believes fly fishing is for everyone at every level. Chandler Buck teaches school and coaches football in Powell, Wyoming. A graduate of Carroll College and a member of their National Football Championship season Chandler made Lewis and Clark Expeditions better the day he got behind the oars. An accomplished guide and terrific instructor, Chandler is a guide that you enjoy spending a day with. Bill Denryuter is a consummate outdoorsmen fishing and hunting throughout the year. Bill is kind, considerate and works as hard as anyone on the planet on behalf of our clients. He is always knowledgeable and extremely competent without any arrogance or conceit that filters into lesser guides. Jensen Howard has the distinction of being the son of John Howard where the apple has not fallen far from the tree. He attends Montana State University in Bozeman. Gear-boaters in my mind are the unsung heroes of our river trips. Regardless of the weather and water conditions they have to get downstream and unload literally a ton of gear. They are putting up tents, showers, chopping wood, chilling wine, putting together a kitchen and doing every small task imaginable to bring comfort and customer service to our clients. Jensen does all this with enthusiasm and a smile.